Research teams looking into air pollution in India, housing conditions in Mexico and perceptions of skin color in Ghana are among the inaugural seven recipients of the President’s Award for Global Learning at The University of Texas at Austin. After a highly competitive process, the interdisciplinary teams were chosen to receive up to $25,000 and fully funded travel to implement research, social impact and entrepreneurship projects in seven regions across the world during summer 2019. 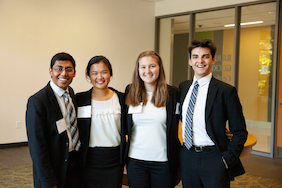 The team selected for Europe, Russia, and the Caucasus for their proposal Lowering Maternal Mortality Rates: What Texas Can Learn from the Republic of Georgia consists of four Plan II students: Anastasiya Byelousova, Parth Gupta, Michael Sanchez, and Lyndsey Wang. They are led by professors Dr. Amy Liu and Dr. Sharmila Rudrappa. Another Plan II student, Edith Muleiro, is on the team selected for the Middle East and Central Asia, for their proposal to analyze and address empowerment through the creation and study of appropriate, sustainable menstrual hygiene products for women in refugee camps in Lebanon. That team is led by professors Dr. Janet Ellzey, Dr. Noël Busch-Armendariz, and Dr. Katherine Polston. Congrats to these outstanding students and to all the selected teams!